Five Flower Lake is located north of Sichuan, China in the Jiuzhaigou Valley or Valley of Nine Villages. It sits on the edge of the Tibetan Plateau and within the Min Mountains. Jiuzhaigou Valley is desginated a UNESCO World Heritage Site and World Biosphere Reserve. The lakebed is covered in a crosshatch of ancient fallen trees. 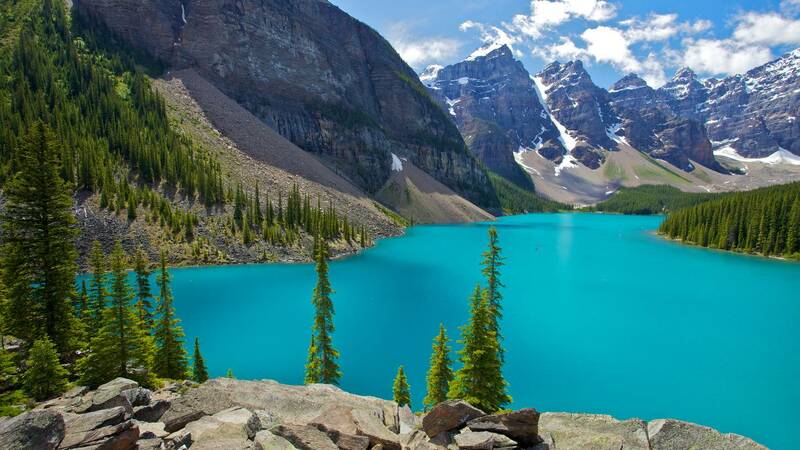 The name of the lake comes from the idea that there are many different colours in it like a flower garden. Cheow Wan Lake is a man-made lake created in 1982 as a source of electricity. It is 165 square kilometers. The Khao Sok National Park is a virgin rainforest more ancient and diverse than the Amazon. As an off-the-beaten path location Khao Sok has all the beauty of Thailand without all the tourism. There are also floating bungalows and raft expeditions so it’s basically paradise. Inle Lake has a small but growing tourism industry. The best time to visit is during the Hpaung Daw U Pagoda Festival in September-October every year. Lake Pichola is a man-made lake created in the year 1362 AD. Lake Pichola has two islands and numerous palaces including the Lake Palace built in the 1700s, which now operates as a luxury 83 room hotel with white marble walls and round the clock butler service. Iskanderkul is a glacial lake in the Fann Mountains of Tajikistan. It gets its name form the Persian pronunciation of Alexander (Islander) and the Tajik word for lake (kul) in reference to Alexander the Great. Melissani Lake is found in a cave on the Island of Kefalonia. In Greek mythology Melissani Cave is known as the Cave of the Nymphs. Located in the Chilean Patagonia, Lake Pehoe is an unspoiled natural wonder with beautiful crystalline waters. Known as the highest navigable lake in the world, Lake Titicaca lies at an elevation of 3,812 metres (12,507 ft). Lake Titicaca is also known for the Uros islands, a group of islands made of totora reeds and inhabited by the Uru people. Yucatan Cave Lake is made up of a system of cenotes. The Yucatan peninsula has few sources of fresh water without cenotes and many ancient Mayan cities like Chichen Itza were built around these essential natural wells. The Laguna Verde or green lake is a natural salt lake located at the foot of the Licancabur volcano. Laguna Verde is known for its emerald green waters, its hot springs, and the resident flamingos. Lake Wakatipu is an 80km long lake with a floor below sea level making it an exceptionally deep lake. It’s also known for being the site of some scenes from The Lord of the Rings: The Fellowship of the Ring. Lake Lucerne borders three Swiss cantons or member states of the federal state of Switzerland. Beethoven’s Moonlight Sonata derives its name from the moonlight shining on Lake Lucerne. The Sognefjorden is the largest fjord or glacial inlet in Norway and the longest in the world at 205 kilometres (127 mi). Sognefjorden attracts significant tourism to the many villages and municipalities it runs through. Lake Annecy is known as Europe’s cleanest lake because of strict environmental regulations. It’s around 14km long and features a bike path passing through numerous villages around the lake. Famously (and unfortunately) known as the summer home of George Clooney, Lake Como has been a luxurious have for celebrities and the wealthy since Roman times. Other notable residents include Madonna, Gianni Versace, Sylvester Stallone, and Ronaldinho. There are numerous villas and resorts surrounding the lake, some of which were built by Pliny the Elder over 2000 years ago. Located in the oldest national park in Southestern Europe, the Plitvice Lakes has only gained prominence in recent years as Croatia has become a more popular vacation spot. The park is famous for its 16 azure lakes arranged in cascades. Lake Louise is known for it’s beautiful emerald waters and the famous Fairmont Chateau Lake Louise on it’s eastern shore. The Chateau Lake Louise is one of Canada’s grand railway hotels and has become a national landmark. Crater Lake is a caldera lake created by the collapse of the volcano Mount Mazama. Crater Lake is also known for the Old Man of the Lake, a 9 meter (30ft) tree stump that’s been bobbing vertically in the water for over a century.